Wednesday March 21, Rosario Marin Ex US Treasurer, Eduardo Quezada, President of Spanish Division at snn.bz, Fabian Nuñez and Enrique Morones were recognized, in a ceremony commemorating 20 years of Mexico’s constitutional amendment that gave Mexicans dual citizenship in the United States. The Constitutional Amendment of the Mexican Nationality was enacted on March 20, 1998, with the amendment of articles 30, 32 and 37 of the Political Constitution of Mexico by allowing the “No Loss of Mexican Nationality”. With this reform the door was opened to acquire double or multiple nationality of Mexicans by birth. Those involved in the long process of a constitutional reform talked at the event, among them Natividad González Paras, ambassadors Miguel Angel González Felix, and Carlos Pujalte Pineiro, as well as Fernando Solís Cámara. 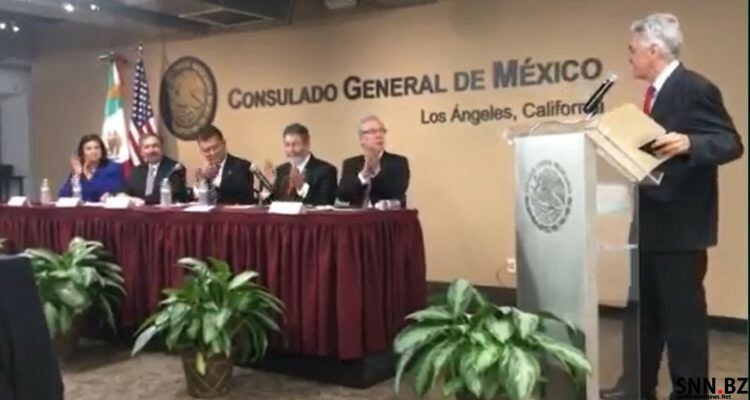 During the event Consul General of Mexico in Los Angeles, Carlos Eugenio Garcia de Alba mentioned that to date two million 101 thousand 509 Mexicans have made the process of obtaining dual citizenship and it is estimated that about three million people living in the United States can still benefit from this measure. Natividad González Paras said that “Even if they opt for US citizenship, Mexicans will never stop being Mexicans, as they did in the past, and they can also protect themselves in all their rights and electoral, property and other implications,” said González Paras. “The impact of 20 years has been great and never before has a constitutional reform had a social impact like the one it had in giving protection to Mexicans both in Mexico and the United States and being able to go from one side of the border to the other”. Adding that with the reform “we went from rejecting the measure to a consensus and breaking a paradigm about nationalism in Mexico that has always marked the essence of the Mexicans themselves”. “What was achieved with this law 20 years ago is that a Mexican would never again lose his Mexican nationality as he did in the past nor be touched in his heart and roots”, said Solís Cámara, after noting that this has been a topic of human rights and to put an end to historical closure. Rosario Marin, upon receiving her Mexican passport, remembered her mother when she told her at the time when she became a US citizen years ago: “‘You will always be a Mexican daughter’, and now with time I can confirm that what she said to me my mother was right, I always was and always will be proudly Mexican, ” she said. And she added “Thanks to this law as a Mexican I can vote abroad and I can be in Mexico: Maria del Rosario Marin Espindola or simply Rosario Marin in the United States and receive the benefits of the two nations”. Others who received their Mexican passport were yours truly Eduardo Quezada as well as Alfonso Feria Kaiser who works in the National Aeronautics and Space Administration (NASA) and Fabian Nuñez. Nuñez, who was a leader of the California assembly and who was born in San Diego, the son of Mexican parents commented: “I have always considered myself Mexican,” he said, noting that one can have loyalty to the two nations.